There is perhaps nothing we take for granted more than the ability to speak without effort. We communicate every day without conscious thought, conveying information and interacting with others via repeated phonatory tasks. Teachers, in particular, rely heavily upon their voices for job performance, and this is exponentially true for teachers of vocal music who not only speak, but repeatedly sing. Even a temporary loss of vocal quality or stamina can be a serious handicap in the classroom. In addition to our own health, teachers of vocal music must also be aware of the health of our students. The voice is a physical system to which injury can occur in a variety of ways, and it is critical that vocal music educators have knowledge of the potential disorders that can occur, the symptoms that can arise, and of avenues for treatment, so that we may best encourage our students to pursue medical intervention when necessary. In 2005, after five years in the public school system as a choral music educator, I received a diagnosis of “bilateral vocal fold paresis”. I had been struggling for months with loss of vocal quality and control, loss of pitch range, loss of ability to increase volume, vocal fatigue, and severe pain with phonation. I was having extreme difficulty fulfilling the duties of my job and using my voice beyond the classroom. I was terrified, and feared the loss of my career. As a result of the fact that I knew very little about the physical system of the voice or of the cascade of symptoms that can result in the event of injury or disorder, I had no frame of reference within which to understand what was happening. A laryngologist and two clinical interns sat with me while we watched a video screen upon which was projected my vocal folds moving in slow motion. I could see that one of them appeared to be moving efficiently, while the other limped toward the midline like a runner with a twisted ankle. They discussed things like “denervation” and “glottal insufficiency,” and I felt an increasing sense of dread. Although the diagnosis was welcome after a long journey of medical referral to increasingly specialized physicians, I had no idea what it meant, or what my prognosis would be. I didn’t know what I had done to cause the problem, or what I could do to help myself recover. In addition, the word “paresis” sounded frighteningly similar to “paralysis,” and I felt in my gut that it implied something extremely negative. I began my teaching career at age 24. After completion of my undergraduate degree in music education, I secured a job at a large high school in Georgia. I was the choral director, and I worked hard to build the program and to develop comprehensive musicianship among my students. I labored to teach literacy and to develop their ears, and I avoided playing vocal lines on the piano, choosing to demonstrate vocally, instead. I used my light, coloratura-type voice regularly, and it never occurred to me that I might lose it for some reason other than the degeneration that comes with age. After three years at the high school level, I moved to South Carolina and took a position at a large middle school. I don’t remember much about those early transition weeks other than the fact that I was actively adjusting to a new school and a new student demographic. I remember strategizing about literacy activities, aural skills, and literature, and I know that I felt happy and challenged in my new job. However, by the end of the first month, I was going home complaining that my voice hurt. At first, it was a nagging pain that was more irritating than limiting, and I only noticed it during the last periods. By the middle of September, however, it had begun to occur by mid-day, and the pain had intensified. At the time, my greatest fear was that I had developed a vocal nodule, and I began to seek medical attention from my primary care physician. He was a kindly man, and he listened intently to what I had to say, dutifully looking at as much of my throat as he could see with a small mirror on the end of a stick. I explained that I wasn’t speaking more loudly than I had before and that I hadn’t done any excessive singing. He listened, and then told me that he couldn’t see any evidence of a nodule or polyp. Everything looked normal. He referred me to an otolaryngologist (ear, nose and throat doctor [ENT]), and I went about my days desperately waiting for the appointment. I was referred to the best ENT in the area, and I was hopeful that he could give me some indication of what was going on. By the end of the month, the pain began when I woke and persisted until I went to sleep. What had begun as an irritation turned into a raging white-hot burn that occurred whenever I used my voice and was impossible to ignore. Volume didn’t matter. Duration didn’t matter. The closest I can come to describing it is what it might feel like for someone to cough violently for days and then drink lemon juice. It literally hurt to speak. Not a little, but a lot. To make that fact even more frightening, vocal aberrations began to occur. My normally light and flexible soprano disappeared completely. I could no longer produce the pitches I had been able to produce my entire life. During my college years, I toured with a music group for nearly a year, and I popped up to a high D effortlessly during each performance. Now, the highest pitch I could produce was a G, and when I would attempt to do that, my throat felt exactly as it would have had I tried to sing beyond my physical range before the aberrations began. In addition, it was as though the muscles could no longer coordinate in the right way to produce sound. There were moments when my brain would tell my voice to do something, and instead of the intended sound, something very different would emerge. I developed profound empathy for young men undergoing voice mutation. Finally, I realized one day, very suddenly, that I could no longer project volume. I was standing behind a student in a very noisy cafeteria yelling her name at the top of my lungs, but the student couldn’t hear me. Eventually, I grabbed another student and asked him to get her attention by shouting, which he easily did. By the time I found myself in the ENT’s office, I was desperate for answers. Besides the fact that I seemed to have lost my singing voice, I was having extreme difficulty carrying out normal everyday activities that involved speech. I explained that the pain was so bad I found myself avoiding the need for conversation. I would close my mouth and listen to people, and then give them one or two word responses. I withdrew from social interaction and felt isolated. I begged the doctor to please use all possible diagnostic measures and to explore all possibilities. He visualized my vocal folds with a transnasal fiberoptic camera and asked me to execute a number of vocal tasks. At the conclusion of the examination, he said, “Ms. Johnston, I just don’t see anything obviously wrong.” I burst into tears. I remember frantically attempting to explain to him that I wasn’t a hypochondriac and that I knew my voice better than a lay person would. I told him that I knew in my gut something was terribly wrong. I explained that I could no longer carry out work duties without being in agony, and that I feared the loss of my career. He instructed me to go on complete and total vocal rest (no speaking, whispering, or mouthing of words for a month) and seemed burdened by my situation. He didn’t have any ready answers, but promised to get me a referral to someone who could help. It was at that point that I believe there was divine intervention, because I wound up at the Center for Voice Disorders at Wake Forest University with one of the foremost experts of diagnosis and management of Vocal Fold Paresis (VFP). VFP is one of many disorders that can affect vocal quality, pitch, volume, resonance, endurance, and effort; it can also cause pain with phonation (Vachha, Cunnane, Mallur & Moonis 2013). The National Institute on Deafness and other Communication Disorders (NIDCD) estimated that approximately 7.5 million people in the United States might have voice disorders (Sataloff 2011), and in a recent examination of occupational risk factors among teachers, Van Houtte, Claeys, Wuyts & Van Lierde (2012) reported that, of 994 participants, 51.2% presented with voice disorders. Not surprisingly, teachers are at increased risk for developing a voice disorder “due to prolonged and intense occupational voice use” (Van Houtte et al., 107). A disorder is any condition in which the normal or regular functions of the voice are in some way compromised (Aaronson & Bless 2009). Voice disorders are generally classified into two primary categories: organic or functional; nevertheless, they may be of multiple etiologies (Rubin, Sataloff & Korovin 2014; Unger, Schuster, Kecker, Schick & Lohscheller 2013; Stager 2014; Aaronson 1990). Organic disorders are those in which symptoms are caused by a structural disease of the larynx (e.g., papilloma or carcinoma) or by a systemic disease that alters the structure of the larynx (e.g., denervation or Parkinsonism). Functional, or nonorganic, disorders are not the result of a structural or systemic disease, but rather symptoms arise from improper voice use, as in the case of vocal nodules, cysts, or contact ulcers (Rubin, et al. 2014; Unger et al. 2013; Aaronson 1990). Paresis, and a more serious disorder, paralysis, are classified as neurogenic disorders that are organic, or disorders that involve abnormal nerve input to the musculature involved in phonation, and are not the result of improper voice use (Stager 2014; Syamal and Benniger 2016; Stemple, Glaze and Gerdeman 2000). Stemple et al. (2000) suggest that neurogenic voice disorders are those “directly caused by an interruption of the nervous innervation supplied to the larynx” (114). Paralysis implies complete nerve denervation (e.g., loss of nerve input), with a complete lack of the ability to recruit muscle fiber during voluntary attempts at motion; it occurs after a nerve has been transected or has died completely. Paresis implies partial denervation with a corresponding decrease in the ability to recruit muscle fiber during movement; it occurs because of damage to one or more nerves of the larynx (Stager, 2014; Rubin et al. 2014). As I progressed through the referral process, I found that highly skilled physicians were unable to provide a diagnosis of my condition with the tools typically utilized to assess vocal function. Koufman, Postma, Cummins, and Blalock (2000) suggest, “Vocal fold paresis (VFP) is a relatively common and often overlooked condition that can be difficult to diagnose based on the laryngeal examination alone” (537). The cause of difficulty in diagnosis might be best explained by a discussion of laryngeal biomechanics. Phonation is a result of the highly complex coordination of various muscles, each which receives innervation (e.g., nerve stimulus) from the superior and recurrent laryngeal nerves (Rubin et al. 2014; Stemple et al. 2000). In essence, phonation results from adduction (e.g., bringing together to make sounds) of the vocal folds or abduction (e.g., pulling apart to breathe) of the folds, and lengthening of the folds to produce higher pitches or compressing of the folds to produce lower pitches (Rubin et al. 2014; Doscher 1994). 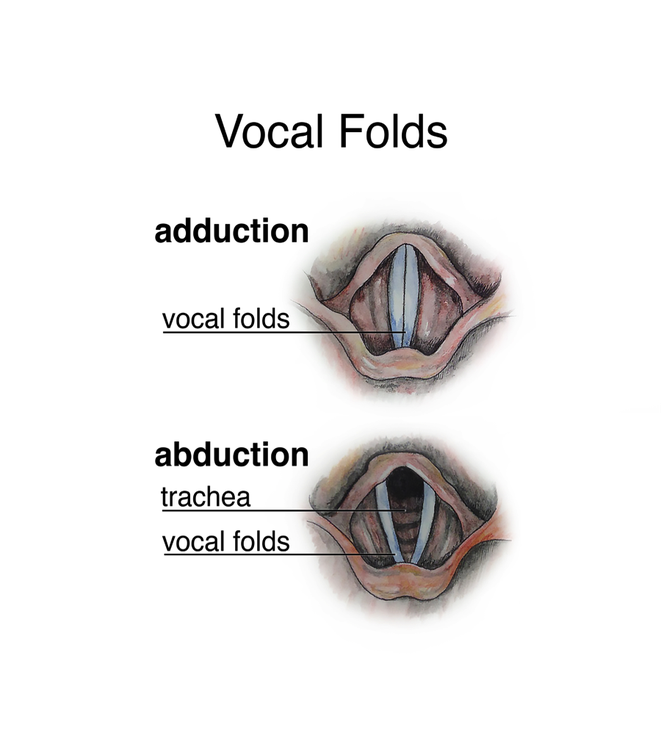 An illustration of vocal fold adduction and abduction may be found in Appendix A. 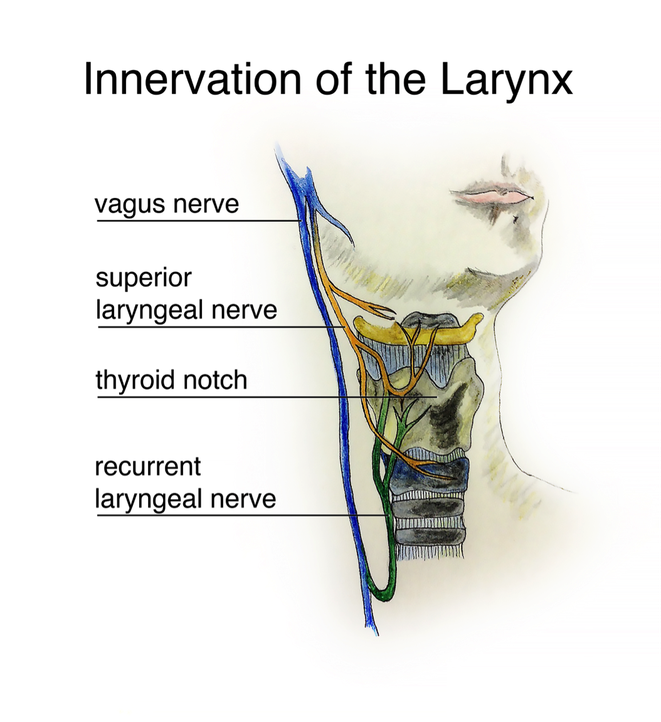 The superior laryngeal nerve (SLN) branches from the vagus nerve, the common cranial nerve pathway for the muscles of the larynx, and provides motor innervation to the cricothyroid muscle, involved in lengthening or compressing the folds during speech or singing (Rubin et al. 2014; Stemple, et al. 2000; Patton and Thibodeau 2016). The recurrent laryngeal nerve (RLN) also branches from the vagus nerve. It provides motor innervation to laryngeal muscles responsible for adduction of the folds during phonation and swallowing, and abduction of the folds during breathing and coughing (Rubin et al. 2014; Stemple, et al. 2000; Patton and Thibodeau 2016); as such, the SLN and RLN work in synchronicity to provide innervation to the larynx. Although the SLN takes a fairly straightforward route from the vagus nerve, the RLN has a circuitous pathway, traveling into the chest cavity and curving back into the neck until reaching the larynx; therefore, the RLN is at greater risk of injury than the SLN. Additionally, because the RLN and SLN have separate pathways, it is possible to incur damage to only one nerve while the other remains completely healthy (Aaronson & Bless 2009). An illustration of the innervation of the larynx, including the superior laryngeal nerve and recurrent laryngeal nerve may be found in Appendix B. Injury to either of the primary nerves of the larynx results in a constellation of compromised function, depending upon the location and severity of the damage (Stager 2014). Injury to the SLN affects vocal fold position by altering or limiting the movement of the cricothyroid muscle, whose function is to lengthen or compress the folds during speech and singing; therefore SLN paresis results in disturbance or limitation of voice pitch (Stager 2014). Damage to the RLN affects vocal fold position by altering or limiting the ability of the muscles that adduct and abduct the folds. In the case of glottal insufficiency (e.g., incomplete closure), mild to severe hoarseness may result, in addition to “breathiness” (e.g., excess air in the tone), greater need to frequently breathe during speaking and singing, and difficulty increasing volume. In the case of limited opening of the folds, breathing may be difficult and restricted (Rubin et al. 2014). Varying degrees of incompetence of the vocal mechanism are possible in VFP. Syamal and Benninger (2016) suggest, “For the otolaryngologist, the term ‘vocal fold paresis’ represents a spectrum of motion impairment that can range from being nearly imperceptible to complete and obvious paralysis” (197). In addition, there are multiple ways that the SLN and RLN may incur damage. Stager (2014) presents possible etiologies as iatrogenic (e.g., caused by medical treatment or a physician), viral, malignant (e.g., caused by cancers), and idiopathic (e.g., of unknown origin). Syamal and Benninger (2016) additionally assert that systemic neurolgic diseases such as Multiple Sclerosis, and endocrinologic diseases such as hypothyroidism and thyroiditis, may be responsible for VFP; in addition, they identify bacterial infections, such as syphilis and Lyme disease, as possible culprits. Essentially, any disease or force that causes injury to the SLN or RLN by may result in VFP. Among iatrogenic causes, surgery of the thyroid gland or carotid artery is a frequent culprit, and bilateral nerve paralysis is “one of the most feared complications of bilateral thyroidectomy” (Serra, Fontane, Duenas, Duque, Lorente, Trillo & Sancho 2013). In addition, vocal fold immobility is sometimes reported after endotracheal intubation (e.g., a tube inserted past the vocal folds into the trachea) is used for general anesthesia (Xu, Han, Hu, Bai, & Zhang 2012; Stager 2014; Syamal and Benninger 2016). Recently, physicians have begun to suspect that in VFP cases previously considered idiopathic, viral infection might have played a role by causing an inflammatory condition along the nerve pathway. Amin and Koufman (2001) assert, “Cranial nerves are known to be affected by inflammatory neuropathic processes. Bell’s palsy, trigeminal neuralgia, and glossopharyngeal neuralgia are examples of such cranial neuropathies. These represent isolated nerve injuries that result in motor and sensory dysfunction (e.g., paralysis, pain), depending on the nerves affected” (251). I made the drive to Wake Forest University with a great deal of trepidation. I had already had two physicians tell me they could see nothing abnormal. There was no evidence of a nodule or cyst, no scar tissue or other structural abnormality, and the folds appeared to move normally during laryngoscopy. I had been on strict voice rest for nearly a month. When you are director of a middle school choral program 250 students large and a concert is rapidly approaching, that is no small task. I was exceptionally dogged, and I developed classroom management skills that did not involve using my voice. When my physician required complete and total silence from me, I quickly informed my students of the situation. Although it seems counterintuitive, once they were aware that I had a problem and needed their help, classroom focus and attention improved. To communicate, I wrote on the board for the students to read, or wrote on a tablet so that another student could give rehearsal instructions. We sang on solfege using the Curwin hand signs, and I conducted through pattern and gesture. This is something that I strongly recommend as a general practice with vocal students of all ages; the use of solfege assists students in being concretely aware of each and every pitch they are singing, in addition to the relationship of that pitch to all of the others in the key. In addition, inclusion of kinesthetic elements, particularly the use of hand signs, improves pitch accuracy and addresses multiple modalities of learning. I had already layered instruction in such a way that I could communicate tonal information by signing patterns in the air instead of singing them aloud. As a result, teaching music without a voice was possible. In addition to clarifying tonal information, the use of solfege dramatically improves intonation and tone, as students produce a single vowel per pitch, without the confounding variable of continuous vowel modification via consonant production that exists when singing on text. When the period of complete voice rest began, my middle school students were approaching the point at which we needed to begin learning textual elements. I approach text as though it is a distinct curriculum, particularly when the students will be singing in English; without doing so, they import speech production habits into their singing, and vowel purity is compromised. I often dissect individual words and teach pure vowel production without consonants, then insert consonants while teaching students to produce them as rapidly and concisely as possible. To do this without a voice, I had a colleague sing vocal lines into a tape recorder, and I used the recording to demonstrate textual elements. I was able to mouth words to physically demonstrate particular vowel shapes and consonant production even though I couldn’t sing, and my students watched with rapt attention in the absence of sound. The kids knew it was a desperate situation, and were unusually attentive and well behaved. Thankfully, classroom management techniques were already in place when the period of voice rest began. At the beginning of the year I had developed a system of clapping rhythm patterns to gather students to attention or to refocus them, and had rehearsed them until they became habitual. In addition, I devised a set of general instructions for each class that I put on color-coded poster boards. A set of yellow posters gave management instructions like “Silently Watch” and “At Ease”. A set of blue posters gave physical instructions like “Sit Tall”, “Round Lips”, “Elongate Vowel”, or “Drop Chin”, and a set of green posters contained musical information, like “Pitch is Flat” or “Altos Too Loud”. While they sang, I would flip through to find the instruction and display it. We made it work. I remember the diagnostic Laryngeal Electromyography (LEMG) because I was awake and aware of the fact that they were sticking long needles into my extremely vulnerable and exposed neck while lay supine to speak and sing for them. I remember the insertion of the needle into the muscles on the right side of my neck and the concomitant output from the machine. It sounded like a miniature machine gun in continual fire. I remember insertion of the needle into the left side, and the moment that I began to speak and sing. As soon as the output began to register to my brain, I realized how unlike a machine gun it sounded. The noise was irregular and without predictable pattern. It was definitely not the same sound I had heard a few moments earlier. I also vividly remember walking into an office belonging to a speech-language pathologist who was examining the acoustical analysis of my phonation. He was holding diagnostic imaging from all of the tests I had undergone to that point, and had his back to me when I entered the room. He said, “Are you Rebecca Johnston?” and I said: “Yes.” At that one word, he swiveled suddenly around in his chair with a startled expression. “Based upon these results, Rebecca, I would have expected you to sound like a sixty-year-old smoker.” I gawked at him and then listened to his explanation of my body’s very efficient compensatory muscular adaptations. Apparently, when the sound that my brain expected to hear from my voice began to change, my body automatically adjusted and used other muscles to maintain the quality of sound. I could no longer sing, but I could speak normally, and I shouldn’t have been able to. This is one of the reasons I consider myself to be extremely lucky. The clinical manifestations of VFP are, understandably, more difficult for singers and professional voice users than for others. Singers are usually more aware of their voices than nonsingers; therefore, they might more readily identify symptoms and recognize potential anomalies of the voice. In addition, professional voice users rely upon the ability to phonate in order to fulfill employment obligations, and as a result, difficulty in phonation may be more apparent to this population than to lay-persons (Van Houtte, Claeys, Wuyts, & Van Lierde 2012). As a result, delay in seeking attention might therefore be shorter, and the persistence often necessary to receive a complete diagnosis might therefore be increased. As previously mentioned, diagnosis of VFP is challenging for the otolaryngologist (Stager 2014; Woo et al. 2015; Syamal and Benninger 2016). Paresis might be unilateral or bilateral and might involve the SLN, the RLN, or both. The normal configuration for effortless phonation is one in which vocal fold closure is complete along the entire length of the folds, and there is no additional involvement from muscular structures of the larynx that do not usually assist in phonation (Rubin et al. 2014). However, in the voice affected by paresis, vocal fold hypomobility (e.g., decreased motion) disrupts the ability of the folds to close normally along their length, and the resulting glottal insufficiency is counteracted by an attempt of the surrounding muscles to complete closure. These excessive muscular behaviors manifest as characteristic muscle tension patterns that are often the first and most easily detectible sign of an underlying neurogenic disorder (Rubin, et al. 2014). Diagnosis requires referral to specialists in the field of laryngology, although a general practitioner or local ENT will often begin with a laryngeal mirror. The physician inserts a small mirror at the end of an extension rod into the patient’s pharynx (e.g., mouth cavity), and utilizes it to visualize the vocal folds. Upon suspecting abnormalities, the more advanced clinic might employ endoscopy or videoendoscopy, which may be recorded for later viewing (Stage 2014; Syamal and Benninger 2016). During endoscopy, a small fiberoptic camera connected to a tube containing wiring is inserted through the patient’s nose and directed toward the mouth cavity. In this way, the vocal folds may be visualized clearly during phonatory tasks. If no abnormalities are visible upon endoscopy, videostroboscopy might be employed in order to provide analysis in greater detail (Stager 2014; Syamal and Benninger 2016). Human vocal folds vibrate at a rate much faster than the naked eye can perceive. Stroboscopy might be compared to the stop-action function of a camera while recording the moving wings of a humming bird: the motion is far too fast to see, so the camera records only one fraction of a second among many in a repeating pattern. Subsequent connection of the images allows recording and playback for slow-motion review of small movement of the vocal folds. Videostroboscopy is useful in assessing vocal fold muscle tone, as the action of these muscles is then clearly visible. If one or more muscles do not move in the normal fashion, or if the vibratory pattern of the folds is uneven, it will become apparent upon slow-motion review. However, detection of inefficient muscular activity by visual means only elucidates part of the diagnostic picture in VFP because the integrity of the neural circuit must then be examined (Stager 2014). The definitive diagnostic tool for suspected neuropathy (nerve damage) is laryngeal electromyography, or LEMG (Stager 2014; Woo, Parasher, Isseroff, Richards & Sivak 2015; Koufman, Postma, Whang, Rees, Amin, Belafsky, Johnson, Connolly & Walker 2001). Koufman et al. (2001) assert: “Diagnostic laryngeal electromyography (LEMG) reliably evaluates the electrophysiologic status of the larynx and often provides critical clinical information that no other test can provide” (603). LEMG measures electrical signal that produces an audible output, and is conducted by an otolaryngologist with an attending neurologist (Woo et al. 2015). During examination, the patient is awake and supine (lying down) with the head tilted back, and a small needle is inserted into each of the major laryngeal muscles responsible for phonation. Electrical activity in the muscle is measured in response to other electrical signals, and according to Koufman et al. (2001), the timing and severity of a neuropathic laryngeal injury can be determined by LEMG. In addition, LEMG can assist in determining the prognosis for recovery of a neuropathic laryngeal injury (Stager 2014; Syamal and Benninger 2016) via analysis of synkinesis (involuntary movement or electrical activity that accompanies a voluntary movement) and spontaneous movement in the absence of stimuli (Syamal and Benninger 2016; Koufman et al. 2001). The ability to determine whether the neuropathy is old or ongoing is of importance. Old neuropathies have little chance of spontaneous recovery or reinnervation; newer or ongoing neuropathies might gradually or suddenly recover as the body attempts to reroute lost nerve signal (Stager 2014; Koufman et al. 2001). Conservative treatments for VFP focus on voice and speech therapies that help to “re-train” the body to use laryngeal musculature as efficiently as possible in coordination with breath (Stager 2014). Many VFP patients have glottal insufficiency; therefore, air escapes during speaking and singing, and therefore these activities require greater than normal air intake. Most VFP patients are put on an acid reflux diet because any inflammation in the larynx may cause irritation and increase difficulty in phonation (Koufman et al. 2000). As previously mentioned, in some cases, particularly in a newer neuropathy, the nerve pathway can regenerate. As a result, conservative treatments are usually attempted before surgical intervention. The surgical options for VFP are varied and depend upon the degree of nerve damage and the location of the affected muscles. One procedure that is frequently used is injection of collagen, Teflon (polytetraflouroethylene) or hyaluronan to the hypomobile fold (Stager 2014; Hertegard, et. al. 2002; Sataloff 2005b). The injected material pushes the paralyzed fold to the midline of the voice, potentially allowing the unaffected vocal fold to meet it more effectively. Injection carries risks, however: injection of too much material may result in correction past the midline of the voice, and injection that is too close to the vocal fold mucosa can result in markedly decreased vocal quality (Sataloff 2005b). An alternative surgical option is available for patients with one or more vocal folds affected by paresis: medicalization laryngoplasty (ML). This technique has replaced injection augmentation as a more popular surgical treatment for focal fold paresis and, according to Koufman and Postma (1999), the procedure “may be used to correct mild to moderate degrees of glottal incompetence, even if the folds are normally mobile” (321). Postoperative improvement in closure is achieved by placing Silastic (a compound of silicone and plastic) implants adjacent to the vocal folds, which permanently straightens them so that they meet the midline uniformly (Stager 2014; Koufman and Postma 1999). The surgery is carried out under local anesthesia while the patient is awake, but sedated, and allows surgeons to require phonatory tasks of the patient while implants are placed in the most optimal location. ML carries the same risk as injection augmentation, in that overcorrection past the midline of the voice is possible, but unlike injection, ML is reversible: the Silastic implants may be taken out or repositioned if the surgical outcome is undesirable (Koufman and Postma 1999). The diagnosis of VFP was frightening but welcome because it provided an immediate and dramatic solution to the neuralgia (neurological pain) that I had endured for half a year. My physician at the Center for Voice Disorders immediately prescribed a course of Gabapentin, an anticonvulsant that is used to relieve neuropathic pain. She explained that the pain I had been experiencing was not a result of damage to my vocal folds; it was purely neurological, similar to amputee victims who still sometimes feel pain in limbs they no longer possess. Within two days of taking Gabapentin, the pain had diminished so substantially that I was dumbfounded, and within a week, I was speaking blissfully pain-free. My complete diagnosis is bilateral vocal fold paresis, as confirmed by video stroboscopy and LEMG. I have incomplete glottal closure with increased amplitude on the right, and compensatory muscle tension patterns are visible via laryngoscope with all phonatory tasks. Examination of my right cricothyroid muscle, supplied by the right SLN, demonstrates markedly reduced muscle fiber recruitment with normal physical appearance (i.e. there are no structural anomalies like a nodule or cyst). Examination of the left thyroarytenoid muscle, supplied by the left RLN, demonstrates dramatically reduced muscle fiber recruitment with normal physical appearance. To put this in simpler terms, I have neuropathies involving the SLN on the right, and the RLN on the left, which have left me vocally handicapped. We discussed surgical options, and I scheduled a medicalization laryngoplasty to occur within one month. My physician explained that the procedure could possibly eliminate the need to take Neurontin, as the compensatory muscular action would probably diminish, and the overloaded muscles would likely stop sending pain signals to my brain. She explained that it would also solve the problem of glottal insufficiency, a symptom that I continue to struggle with today when I attempt to project volume or to sing. The day before the surgery was to occur, after multiple nightmares about being awake while they cut into my neck, I called and cancelled the surgery. After much unrest, I decided that it was fine if I never performed on a stage again, as long as I could speak effectively enough to teach. My opera performance days are long gone, but despite the fact that I opted not to undergo surgery, some neurological recovery occurred, and I can speak without pain as long as my laryngeal muscles are not pushed beyond their capacity to function. When they are, I have to take Neurontin again for a time, until the pain settles. I have learned through the years that they seem to have a tolerance that is built with use, as a quadriceps is built by running. I am careful not to attempt to yell, as I know from experience that one singular act of shouting will render my voice completely ineffectual for the rest of the day and set off a cycle of pain. I am aware that when I try to project to a large lecture hall, I have to breathe more frequently than someone else might to support the sound. I am constantly reminded that, even at maximum volume, if I am in a noisy environment, others will be unable to hear me, and my throat will begin to hurt. As a result, I avoid noisy, crowded environments like the plague. I can still sing, although I do so with a different voice than the one with which I began my career. I can no longer sing soprano, and my voice has lost what used to be extraordinary flexibility. I have difficulty singing smoothly to successively higher pitches, and there is a physical “catching” between each pitch that is visible from the outside if you watch my thyroid cartilage. I am physically incapable of singing loudly, and if my voice is fatigued in any way, the muscular compensation does not happen as effectually; therefore, more excess air escapes in the tone. Despite these residual problems, my students today don’t know that I have a vocal handicap unless I tell them. Occasionally, they notice that I am a bit hoarse, and they take note of the fact that I choose not to speak loudly. However, for the purposes of classroom teaching, my voice works just fine. The hoarseness can be difficult to explain to others. Sometimes I don’t bother to explain at all, choosing instead to say: “I have a sore throat,” with a shrug. That usually works well enough that I don’t have to converse when I am physically unable to do so. In addition, I struggle to communicate why I choose not to perform publicly to colleagues and students. When they hear me sing in class, the sound is mellifluous, and I have a reputation as having “a lovely voice.” What they cannot know is that my vocal function changes dramatically from day to day, depending upon volume and type of use, and that the unpredictable nature of the sounds that come out of my mouth have led to an emotional aversion to solo performance. If pressed, I tell people that it would be like a competitive ice skater that shattered his or her ankle. Although such skaters may technically regain the ability to skate, every time they land from a jump, they will fear the ankle giving way. I can still sing, but I sing for myself, in small environments, or in an ensemble setting. My new voice is not meant for the solo stage. The official cause of my VFP remains idiopathic, although I did have an upper respiratory infection with fever the year that symptoms began. My physician believes it is possible that was the culprit, but at this point, divining a cause is not as important to me as it once was. After years of practice and some neurological recovery, I can speak and sing enough to teach, and I have no trouble performing my job duties. This is one of the reasons that I consider myself extremely lucky. After researching what could have happened had either the SLN or RLN pathways been damaged more severely, or uniformly bilaterally, I know that I am extremely fortunate to have retained functional use of my voice, and full control of breathing and swallowing. I will forever be grateful. As a result of my experience with VFP, I have developed the belief that all teachers should cultivate classroom management techniques that do not rely heavily upon voice use. This is not only possible, but it is highly advisable to avoid the vocal damage that can occur from years of strenuous projection above background noise. In addition, they should endeavor to utilize the voice only when necessary and to actively communicate non-verbally. For the vocal music educator this includes refraining from singing along with the ensemble, refusing to project the voice above the ensemble, minimizing verbal description and maximizing demonstration, and developing a lexicon of gesture to utilize while students are producing sound. In addition, this experience has impacted my understanding of the place of vocal pedagogy in choral classrooms and voice studios. It is imperative that teachers of voice have a working knowledge of the physical system of the voice, potential disorders that can occur, and the physical and auditory symptoms that may arise from those disorders. We must be alert to potential damage that can occur to our students’ vocal systems, and we must be prepared to appropriately encourage students to pursue medical diagnosis. It is additionally imperative that we make our students aware of the challenges they may encounter if their vocal function is disabled, and that we equip them to recognize the signs of vocal distress. Armed with this information, they will be better able to develop positive lifelong habits and to make healthful preventive choices where phonation is concerned. Aaronson, A. 1990. Clinical voice disorders: An interdisciplinary approach. New York, NY: Thieme Medical. viral etiology?” American Journal of Otolaryngology 22:251-256. Doscher, B. 1994. The functional unity of the singing voice. Lanham, MD: Scarecrow Press. Hertegard, S., Hallen, L., Laurent, C., Lindstrom, E., Olofsson, K., Testad, P., & Dahlqvist, A. 2002. “Cross-linked hyaluronan used as augmentation substance for treatment of glottal insufficiency: Safety aspects and vocal fold function.” Laryngoscope 112:2211-2219. Techniques in Otolaryngology Head and Neck Surgery 10:321-324. Otolaryngology Head and Neck Surgery 122:537-541. Patton, K., & Thibodeau, G. 2016. Anatomy & physiology. Atlanta, GA: Elsevier. Rubin, J., Sataloff, R., & Korovin, G. 2014. Diagnosis and treatment of voice disorders. Sataloff, R. 1998. Vocal health and pedagogy. San Diego, CA: Singular. −−−. 2005a. Clinical assessment of voice. San Diego, CA: Plural. −−−. 2005b. Treatment of voice disorders. San Diego, CA: Plural. −−−. 2005c. Voice science. San Diego, CA. Plural. Serra, S., Fontane, J., Duenas, J., Duque, C., Lorente, L., Trillo, L., & Sancho, J. 2013. “Prospective study on loss of signal on the first side during neuromonitoring of the recurrent laryngeal nerve in total thyroidectomy.” British Journal of Surgery 100:662-666. Stager, S. 2014. “Vocal fold paresis: Etiology, clinical diagnosis and clinical management.” Current Opinion in Otolaryngology & Head and Neck Surgery 22: 444-449. Stemple, J., Glaze, L., & Gerdeman, B. 2000. Clinical voice pathology. San Diego, CA: Plural. Syamal, S., & Benninger, M. 2016. “Vocal fold paresis: a review of clinical presentation, differential diagnosis, and prognostic indicators.” Current Opinion in Otolaryngology & Head and Neck Surgery 24: 197-202. Van Houtte, E., Claeys, S., Wuyts, F., & Van Lierde, K. 2012. “Voice disorders in teachers: Occupational risk factors and psycho-emotional factors.” Logopedics Phoniatrics Vocology 37:107-116. Woo, P., Parasher, A., Isseroff, T., Richards, A., & Sivak, M. “Analysis of laryngoscopic features in patients with unilateral vocal fold paresis.” The Laryngoscope 2015, Dec 9: 1-6. Xu, W., Han, D., Hu, R., Bai, Y., & Zhang, L. 2012. “Characteristics of vocal fold immobility following endotracheal intubation.” Annals of Otology, Rhinology and Laryngology 121:689-694.